The cougar is known by many common names, including puma, mountain lion, catamount, and panther. Next to the jaguar, it is the largest North American cat. Weights range from 80-225 pounds (36-103 kg), averaging 140 (64 kg). Length varies from 5-9 feet (150-275 cm); this measurement includes the 26-32 inch (66-82 cm) tail. Males are larger than females. Cougars have long, slender bodies and small, broad, round heads. Ears are short, erect and rounded. The short fur is usually tawny (brownish red-orange to light brown), more tan in the summer months and grayer during the winter. The muzzle, chin and underparts are a creamy white. Black coloring appears on the tip of the tail, behind the ears, and at the base of the whiskers on the sides of the muzzle. Immature cougars are paler, with obvious dark spots on their flanks. 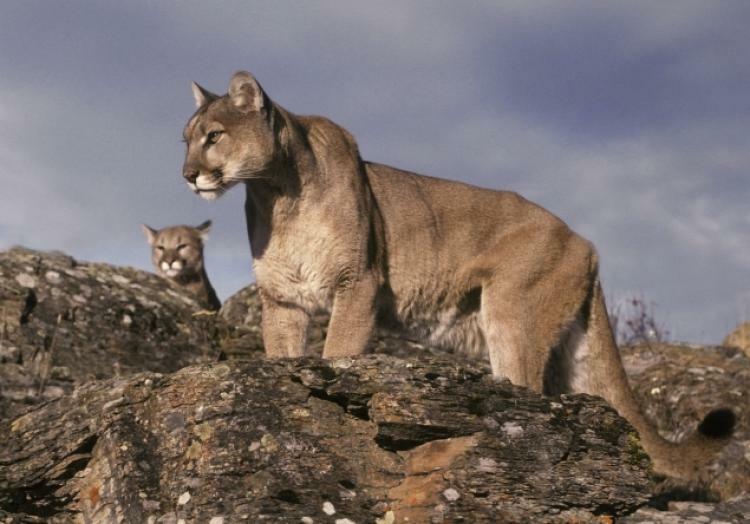 Cougars, long considered extinct in the Northeast, may be prowling around the beautiful backcountry of upstate New York. The regal but dangerous big cats, also known as mountain lions, have reportedly been spotted in the Adirondacks recently, prompting members of an environmental group known as Protect the Adirondacks to create a database to track sightings.